Today's food post is one of my favorite things to make in the evening. Its a really yummy pizza, the crust recipe is adapted from here. I've changed some of the ingredients and measurements here and there, so I thought I'd share. I truly, honestly, eat this at least once a week, so there's also that. Yield: 1 8-inch individual pizza. To begin with, soak the quinoa in a bowl or tupperware overnight with enough water to cover it completely. 2. Make the sauce by adding all the sauce ingredients to a blender until smooth. 3. Transfer your sauce to a small saucepan and leave on medium to low heat, without the lid. 4. While your sauce comes to a boil, drain your quinoa (just reduce the amount of water left as much as possible). 5. Add all of your crust ingredients (minus the coconut oil!) to a blender or food processor and blend until smooth and easy to pour. 6. Check on the sauce, stir, and reduce the heat to low. 8. Put your crust in the oven and set the timer for 25 minutes. 9. 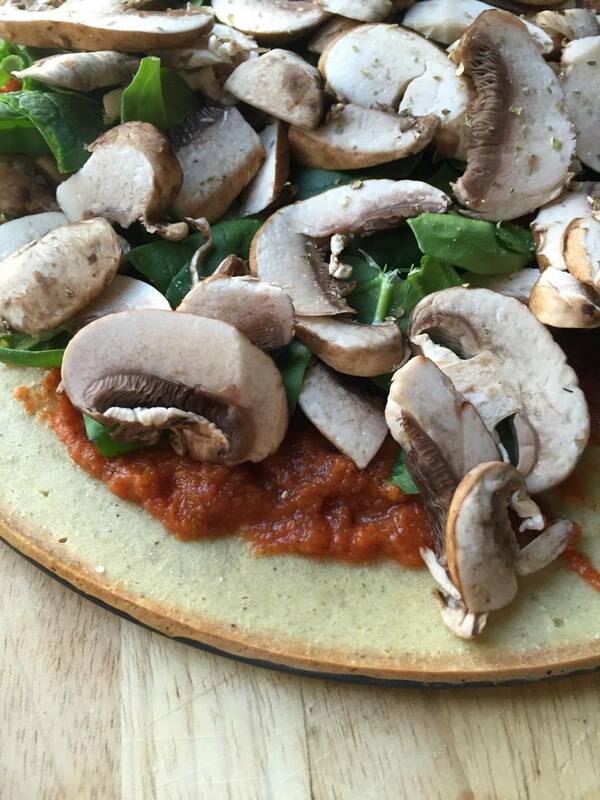 While your crust bakes, slice your mushrooms and spinach and prep any other toppings you'll be using. 10. Your sauce should be ready when you have about 10 minutes left on the crust. However, the goal is for it to thicken so leave it on until it does. 11. Once the 25 minutes are done, pull out your crust and remove the top of the springform. 12. Add your sauce and toppings and put it back in the oven for approximately another 10 minutes. 13. Once your toppings are warmed and wilted enough, remove from the oven and transfer onto a plate. Et voila! You have a incredibly healthy pizza, that you can feel good about eating everyday.